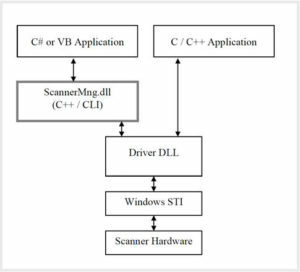 The DCT Duplex/Simplex Mobile Scanner Development Kit provides an application programming interface (API) for controlling DCT scanners. This interface is implemented as a dynamically linked library (DLL) for the Microsoft Windows platform. Through this interface, application programs are able to easily perform scanner operations such as calibrating the scanner, detecting paper, checking button state, and scanning pages in various scan modes and resolutions. Control is provided for various parameters such as brightness, contrast, gamma, highlight and shadow, and custom lookup tables. By handling the low-level operation of the scanner hardware, DCT’s scanner API allows system integrators to shorten development time and focus on application-specific development. The DCT API DLL supports Microsoft Windows 8, 7, Vista, XP. (1) Through a thin translation layer implemented in ScannerMng.dll. (2) By using the P/Invoke mechanism to make calls to the low-level driver DLL. x86 Platform Compatibility: Windows CE version 5.0 and 6.0. ARM Platform Compatibility: Windows CE versions 4.2, 5.0, and 6.0. 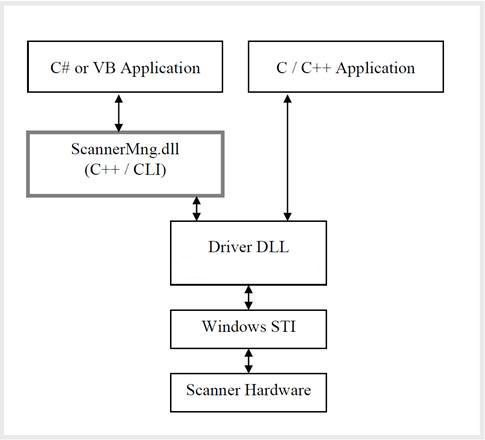 (1) A Linux SDK which includes low-level driver (LLD) and sample code demonstrating its use. Recommended for developers who are writing their own application or who require features not supported by our SANE backend. (2) A SANE backend (i.e. driver) which calls the LLD. Recommended for developers who are using existing SANE applications. We provide pre-built Linux versions using Intel x86 and x86_64 processors only. For other non-Intel platforms, please contact us with detailed information on processor, Linux kernel, and tool set. In general, DocketPort scanners are compatible with TWAIN v1.9a specification. There are standard and custom TWAIN capabilities that the DocketPort scanners support. Please visit TWAIN.org for specifications, tools, sample apps, and developer’s forum.